This page list topics related to Syria. Latakia is the principal port city of Syria, as well as the capital of the Latakia Governorate. Historically, it has also been known as Laodicea in Syria or Laodicea ad Mare. In addition to serving as a port, the city is a manufacturing center for surrounding agricultural towns and villages. 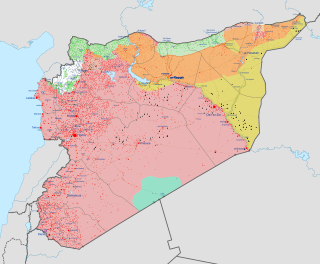 According to the 2004 official census, the population of the city is 383,786, Its population greatly increased as a result of the ongoing Syrian Civil War due to the influx of refugees from rebel and terrorist held areas. It is the 4th-largest city in Syria after Aleppo, Damascus and Homs, and it borders Tartus to the south, Hama to the east, and Idlib to the north while Cape Apostolos Andreas, the most north-eastern tip of Cyprus is about 68 miles (109 km) away. Russia–Syria relations refers to the bilateral relationship between Russia and Syria. Russia has an embassy in Damascus and Syria has an embassy in Moscow. Russia enjoys a historically strong, stable, and friendly relationship with Syria, as it did until the Arab Spring with most of the Arab countries. Russia's only Mediterranean naval base for its Black Sea Fleet is located in the Syrian port of Tartus. Embassy of Syria, Washington, D.C. The Embassy of Syria in Washington, D.C. is the suspended diplomatic mission of the Syrian Arab Republic to the United States. The final ambassador of the Syrian Arab Republic was Imad Moustapha. A Charge D'Affaires has not been named. Iraq–Syria relations are marked by long-shared cultural and political links, as well as former regional rivalry. 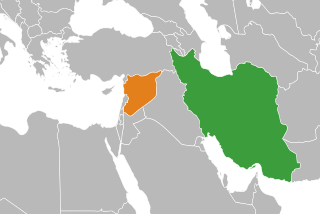 The two countries took their present form after the Sykes–Picot Agreement to dismember the Ottoman Empire into British and French spheres of influence after World War I.
Armenian–Syrian relations are foreign relations between Armenia and Syria. Armenia has an embassy in Damascus and a consulate general in Aleppo. In 1997, Syria opened an embassy in Yerevan. Syrian Foreign Minister Farouk al-Sharaa visited Armenia in March 1992. The Syrian Resistance, formerly known as the Popular Front for the Liberation of the Sanjak of Iskandarun, is a pro-government Syrian armed militia group operating in northwest Syria, claiming a Marxist–Leninist ideology. 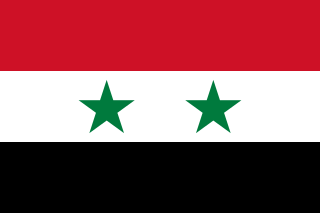 Presidential elections were held in Syria on 3 June 2014. It was the first multi-candidate election in decades since the Ba'ath party came to power in the 1963 coup. 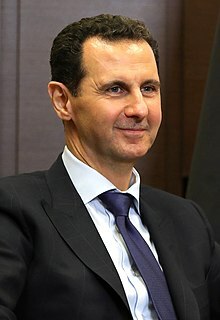 In late April 2014, Bashar al-Assad announced he would run for a third term in Syria's first multi-candidate direct presidential election. Oman–Syria relations refer to the relationship between the Sultanate of Oman and the Syrian Arab Republic. Oman has an embassy in Damascus; while Syria has an embassy in Muscat. Both are members of the Arab League, and despite the ongoing civil war occurring in Syria, Oman has not closed its embassy in Syria and both countries maintain diplomatic relations, in sharp contraction to other Gulf states who have cut off diplomatic ties with Syria and closed their embassies.